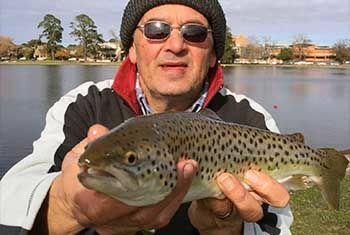 Regular FishingMad contributor John Regali headed up to Ballarat with a few mates to fish lake Wendouree. After a cold early start John managed to catch a healthy 40 plus cm Brown trout which provided a nice fight not to far from the rowing lanes. The bait of choice was a simple light rig using power bait complemented with a small burley cage. It ended up being a quite challenging day and the guys finished with only the trout for the day. Well done John thanks for the report.